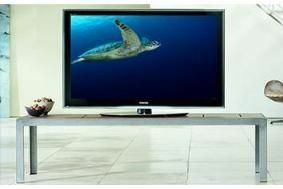 JAPAN: Toshiba, gunning for Panasonic and Sony, eyes emerging markets to boost LCD TV sales | What Hi-Fi? That would give it sales of around 15m TVs, approaching the numbers forecast by Sony, and Panasonic's 15.5m estimate for the current financial year. The company says it will achieve these sales, which will give it a 10% global market share, by shifting its focus from the US, Europe and Japan and instead targeting emerging markets such as the BRIC countries – Brazil, Russia, India and China. One part of this strategy could be the construction of a TV-assembly plant in Russia, to serve the local market and other territories. Toshiba says its currently considering this plan, either going it alone or with a partner. TV demand in the world's established markets has been lacklustre of late but, by cutting prices and appealing to new flatscreen TV buyers in the BRIC countries, Toshiba expects to sell 3m TVs in those territories in the next financial year, against just 1.3m this year. Masaaki Oosumi, the company's VP in charge of digital products, said yesterday that "We're going to come up with entry-models to get into the mass market. Otherwise, we can't expect growth."